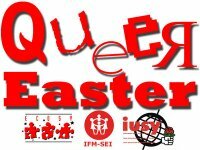 we warmly invite you to our annual Queer Easter seminar. It will take place from 21st of March till 28th of March 2016 in Werftpfuhl and our thematical focus this year will be on community accountability. You will get more information about the draft program in three weeks. The deadline for registration is the 10th of March. If you need a visa to enter Germany, we will need all the data for the visa application by the 15th of February. The participation fee per person depends on the country you come from and will be between 30 and 80 €. For some countries we might be able to provide limited travel cost contributions. If you have any questions, if you need more information, if you have any remarks, do not hesitate to contact me. For people coming from YES (Young European Socialists) member organizations, special conditions apply, a special info will circulated in the next days by Yes-secretariat.